There’s a proven process to starting your Florida kitchen remodel off on the right foot. A kitchen remodel is a big task, one that shouldn’t be rushed into without careful planning, budgeting and plenty of shopping around. In fact, the kitchen is known as one of the more difficult and expensive rooms in your home to remodel. Before you get cold feet it’s important to note that all of your hard work is more than likely to pay off, as kitchen remodels tend to produce the highest return on investment compared to other renovation projects. A kitchen remodel is always easier with Tops Kitchen Cabinet! We offer high quality cabinets, countertops and more at wholesale prices that will allow you to get so much more out of your budget. Your kitchen serves a place to store and cook food, but it is also a place to entertain friends and family. Big or small, the kitchen is the heart of a home. Here’s how to start your kitchen remodel so that the finished product is nothing short of perfection. Before anything else you need to sit down and brainstorm everything you do and don’t want in your newly renovated kitchen. In order to know what you want you need to know your options. Research as much as possible, browse through magazines, look at Pinterest boards and pay close attention to the kitchens you like most. Simply rushing into it could result in a kitchen full of things you want to change months after completion. Setting goals also includes making a budget. Remember, you should always include 15-20% cushion room for unexpected things that pop up along the way. Make sure that your budget is in line with the things you want and make adjustments as necessary. There are many kitchen styles to choose from. Country farmhouse, modern, contemporary, traditional, French country, coastal, Mediterranean, rustic and so forth. Know your style before you start picking out cabinets or appliances so that you can pick the right options to play up your style. You’ve already set a budget and picked out exactly what you want so now it’s time to hit the pavement (or Internet) and start shopping around. Prices will vary dramatically between vendors, which is why it’s so important to get prices from a number of places before making any final decisions. If one thing you really wanted turns out to be more expensive than expected now is your chance to shop around for option B. By doing all of this shopping and planning ahead of time you can pick and pull from different areas of your budget because nothing is ordered or set in stone yet. You can reduce a lot of shopping time and money by simply buying wholesale. Tops Kitchen Cabinet offers a huge variety of cabinets, countertops and more at wholesale prices. Now is the time to start space planning the floor plan for your new kitchen, for instance where will the core appliances be set up? What sort of work zones do you want… food storage, coffee station, cleaning area, etc.? Remember, you will always save money by keeping major appliances in the same space. Otherwise you need to budget in hiring an electrician or plumber to move things like the refrigerator or sink. The goal of your remodel is to make the most out of the space you have. The more storage space you can squeeze into your kitchen the better. That being said, every inch of hardware and cabinetry is going to add up, so don’t waste any space or resources on cabinets that are too high to reach or leave awkward gaps in the wall that translate to wasted space. A way to know exactly how many cabinets you need is to empty out your current cabinets and put everything back in categories. Everything you need to access on a regular basis needs a cabinet that is easy to get to, things that you use less often can go up in higher cabinets or towards the back of cabinet boxes. No matter how much storage you think you need, you could always use more. There are certain things that you may need to store that don’t fit in standard sized cabinets, such as, tall cereal boxes or baking dishes. Get creative with cabinetry in order to accommodate all of these odds and ends to make your kitchen even more functional. There are so many new storage cabinets available on the market, so do your research to find the cabinets you truly need to fit your lifestyle. Be flexible when it comes to moving things like windows and doors. It’s often cheaper and easier to move these sorts of things compared to the sink or oven. Install wall cabinets that reach all the way to the ceiling for added storage. Consider using doors instead of drawers for base cabinets. Dedicate one wall to storage that extends from floor to ceiling. There’s no need to ‘keep up with the Jonses’ when it comes to remodeling your kitchen. Staying within your budget and getting the kitchen of your dreams is possible. You also don’t want to outspend what your neighborhood is worth, otherwise you are not going to recoup as much of the costs. For example, if your home is worth $100,000 it won’t pay off to install a $75,000 kitchen. If you instead install a kitchen that is in line with your home price you could recover as much as 70% of costs when you go to sell your home. Your new kitchen needs to flow with the rest of your house so make sure when you plan your remodel you take into consideration the rest of your home. This includes overall style. A kitchen that is completely opposite of the house it resides in will feel out of place and could scare away potential buyers. You don’t want a really fancy kitchen in a home that is worn down everywhere else. If the rest of your home needs some TLC you might want to spend less on the kitchen and revamp other areas as well. At the very least, have a plan to remodel the rest of the house in the near future so that it fits in with the new kitchen. You may want a warming drawer but how much do you really need one? If your idea of entertaining is going out to dinner than you likely don’t need a warming drawer. On the other hand, if you throw regular dinner parties for friends and family the drawers might be worth the investment. Your needs should be a priority over your wants. Remember, if nothing unexpected pops up you can always use the extra 20% you put aside for emergencies to install some of your wants. There are certain things that can blow your entire budget out of the water. The luxurious splurge might seem worth it at the time but when you are faced with having to make sacrifices in other areas as a result it might not seem so great. If you go all out in one area but cheap out on everything else it can actually make the whole remodel look cheap. Keep it neutral and don’t do anything too trendy or quirky in your kitchen remodel, otherwise you could end up regretting your decision sooner rather than later. An overly personalized kitchen makes for a harder resell because new owners aren’t likely to want the same thing. Even if you are not thinking about reselling your home anytime soon you still risk doing something that quickly goes out of style but is expensive to fix or change. Keep things simple and your life will be less stressful and your kitchen more functional. Simple and efficient is the way to go to please future homebuyers, yourself and your budget. Buying wholesale will save you money so that you have more room in your budget for other things. 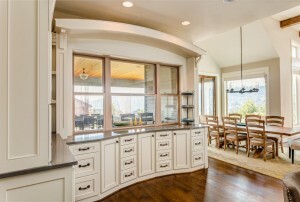 Tops Kitchen Cabinet is here to help make your remodel more affordable and successful.